European intrusions had many impacts on invaded peoples, but less attention has often been paid to changes brought about by the encounter in everyday life and behaviour, both for the Europeans and the other cultures. What changed in diet, dress, agriculture, warfare and use of domesticated animals, for example ? To what degree were attitudes, and thus behaviours affected ? How did changes in the use of types of firearm reorder power structures, indeed lead to the rise and fall of competing local states ? Even the design and planning of houses and cities were affected. 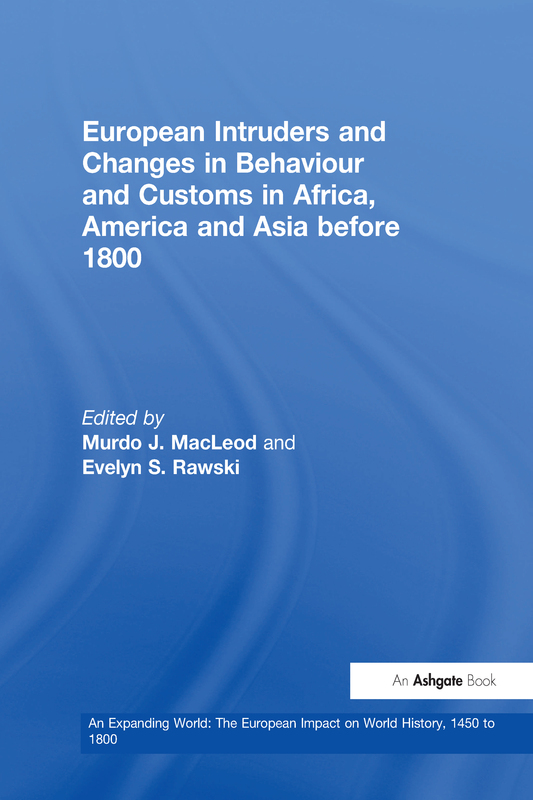 This volume looks at such changes in the early centuries of European expansion. Contents: Introduction; European Impact in America and Africa: The social and economic stability of the Western Sudan in the Middle Ages, M. Malowist; The horse in 15th-century Senegambia, Ivana Elbl; Passive resistance: Hopi responses to Spanish contact and conquest, E. Charles Adams; Social climbers: changing patterns of mobility among the Indians of colonial Peru, Karen Spalding; Indian agriculture, changing subsistence patterns, and the environment on the southern Great Plains, Paul H.Carlson; The process of farming diffusion in the southwest and Great Basin, Joseph C. Winter; La traite Atlantique des esclaves et ses effets économiques et sociaux en Afrique: le cas du Galam, royaume de l’hinterland Sénégambien au dix-huitième siècle, Abdoulaye Bathily; Dahomey and the slave trade: reflections on the historiography of the rise of Dahomey, Robin Law; Forms and types of work, and the acculturation of the colonial Indian of Mesoamerica: some preliminary observations, Murdo J. MacLeod; L’acculturation des Espagnols dans le Mexique colonial: déchéance ou dynamisme culturel? Solange Alberro; European Impact in Asia: Cloth, clothes, and colonialism: India in the 19th century, Bernard S. Cohn; The coming of the Europeans, K.T. Achaya; Bounty from the New World, K.T. Achaya; The introduction of American food plants into China, Ping-ti Ho; From betel-chewing to tobacco-smoking in Indonesia, Anthony Reid; Opium smoking in Ch’ing China, Jonathan Spence; The structure of cities in southeast Asia, 15th to 17th centuries, Anthony Reid; Female roles in pre-colonial southeast Asia, Anthony Reid; Contentious tradition: the debate on Sati in colonial India, Lata Mani; Index.